There are many national parks and reserves throughout South Africa but it is the smaller lesser known ones that often offer the visitor something over and above the "Big Five". Special wild flowers or birds, areas to hike, walk, mountain bike and explore without the worry of getting malaria or being eaten by a big cat! In Mpumalanga within a short driving distance from Stonecutters Lodge you can visit the following day visitor parks. Dullstroom & Verloren Vallei Nature Reserve has a cool, misty, sub-alpine climate, with moist grasslands. The cold, clear rivers feed the marshlands, the most important being Verloren Vallei which is also a RAMSAR site with over 30 wetlands. 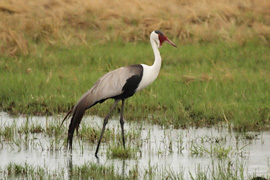 All three of South African rare species of crane live here. Over 200 wild flower species flourish around Dullstroom - and naturalists will revel in the aloes, pink gladioli,orchids, tree ferns, red fire lilies and other amazing plants species. The Gustav Klingbiel and Sterkspruit Nature Reserves are close to Lydenburg These reserves lie close to the Long Tom Pass which from its summit drops 1100m over 8kms in dramatic curves- this sets the scenery hikers, walkers, mountain bikers and birdwatches can expect on walks and trails within these reserves. Thornveld & bushveld on the low-lying areas, montane grassland on hills and plateaus and little pockets of mountain forest in the ravines ensure scintilating birding. The Klipgatspruit carves a deep valley through the mountains Buck and game are plentiful. Archaeological ruins that date back to the iron age and remnants of Anglo-Boer forts lie in this park. The museum houses the famous Lydenburg heads dating back to the sixth century, unearthed in the Sterkspruit valley. Ohrigstad Dam and Nature Reserve: The foothills of the Mauchberg is the source of the Ohrigstad River which is dammed by the wall of the Ohrigstad Dam. With the misty uplands of the Greater Drakensberg escarpment all around, the setting is inspiring. Its a great spot to unpack your binoculars, fishing rod and picnic gear. Close by is the Mt Sheba Nature reserve with its Afromontane forests, exotic looking cycads and ancient yellowwoods where forest birds abound and is a twitcher's dream.